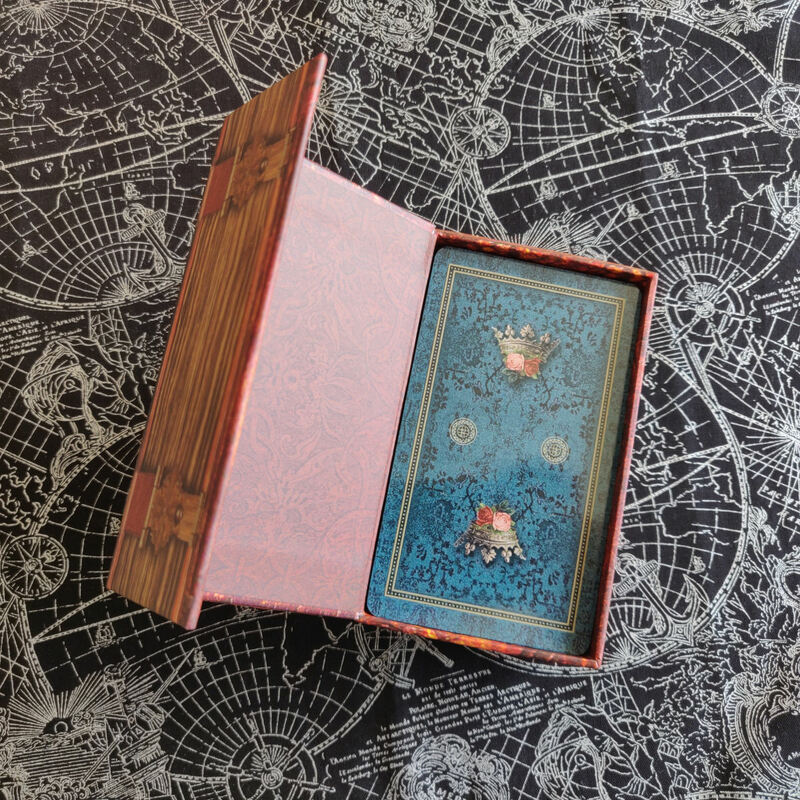 In Tarot of Magical Correspondences, Eugene Vinitski has designed a magician’s deck, and it’s spectacular. 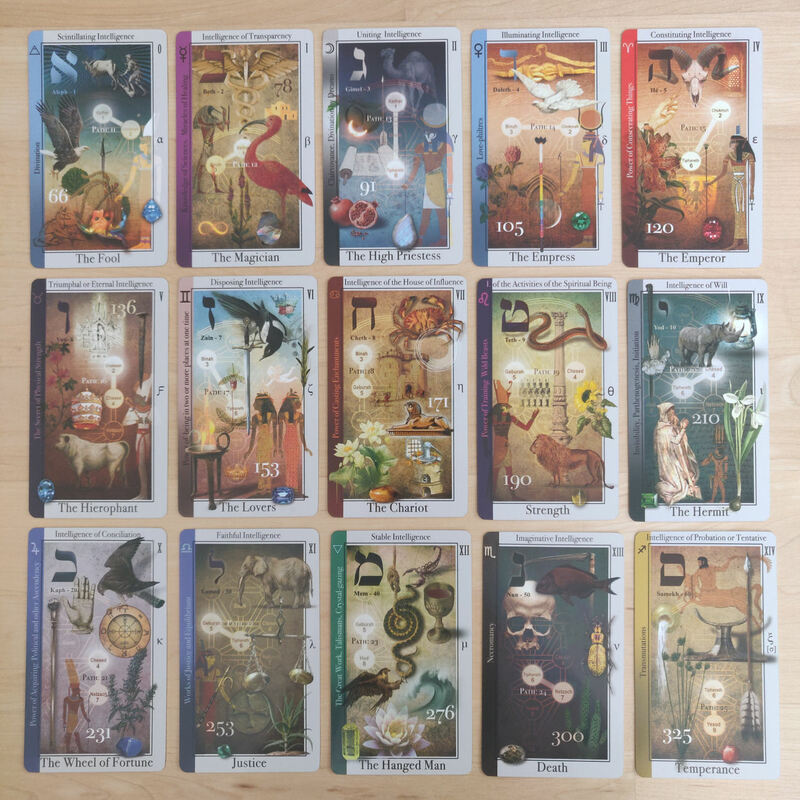 After Kabbalistic Tarot, which I’ve reviewed before here, Vinitski had acquired so much research and knowledge that hadn’t been incorporated into that deck, and so Tarot of Magical Correspondences was born, built upon the works of Eliphas Levi, Aleister Crowley, Manly P. Hall, Paul FOster Case, and Gareth Knight, among others. The cardstock is thick, glossy, high quality, and the edges are gilded. You also get a guidebook packed with an impressive amount of information and substantive content, given its size. Each deck will also come with a Certificate of Authenticity numbered and signed by the deck creator. This is a limited edition deck, with only 700 copies available, so get yours over on Etsy while supplies last. Vinitski notes that Tarot of Magical Correspondences is based largely on the works of Aleister Crowley, and the Kabbalistic references throughout are based on Golden Dawn attributions. Vinitski worked mainly off of Liber 777 by Crowley. 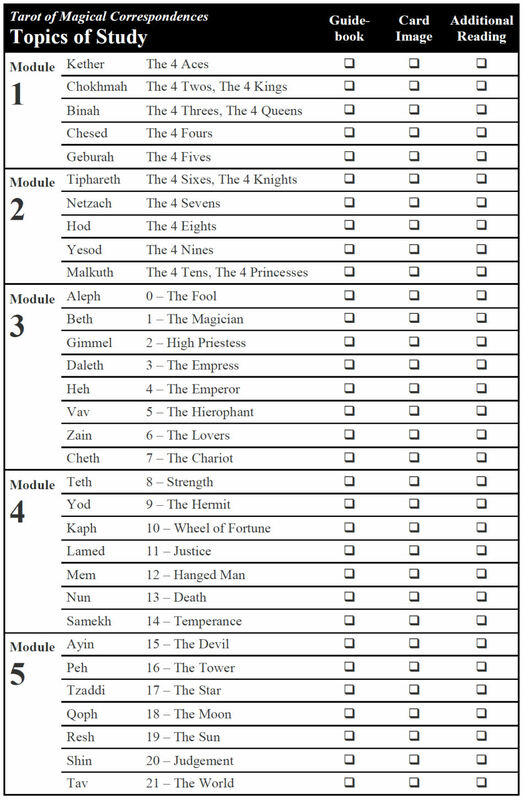 Here, the structure of the deck is with Strength in the position of Key 8 and Justice in the position of Key 11 because, as Vinitski puts it, this ordering follows the 10 Sephiroth of the Tree of Life and 22 letters of the Hebrew alphabet. For each of the Majors, you’ll find pictorial notations of the key’s Hebrew meaning for the corresponding alphabet letter (in the case of The Chariot, it’s Fence, the key’s magical weapon, plants real or imaginary, the precious stone of the key, Egyptian god attribution, mystic number of the Sephiroth (in the case of The Chariot, it’s 171), and a symbol of the Arcana. The left vertical bar of color is the corresponding Queen scale of color for the key (for The Chariot, it’s maroon). The caption at the top (e.g., “Intelligence of the House of Influence”) signifies the path of the Sepher Yetzirah. Here, these magical correspondences and the summation of Key 7: The Chariot can endow the magician with the power of casting enchantments. Key 6: The Lovers endows you with the power of being in two places at one time, and the gift of prophecy. Key 5 endows you with the secret of physical strength. If you’re unable to identify the pictures, the companion guidebook offers an impressive amount of information. So from the guidebook I can look up that the precious stone associated with The Chariot card is amber, the magical weapon here is the furnace, and the flora is watercress. The Egyptian god this key is linked to is Hormakhu, who is represented by the Sphinx. Hormakhu is the god of the noonday sun. Key 8: Strength is associated with the god Horus. 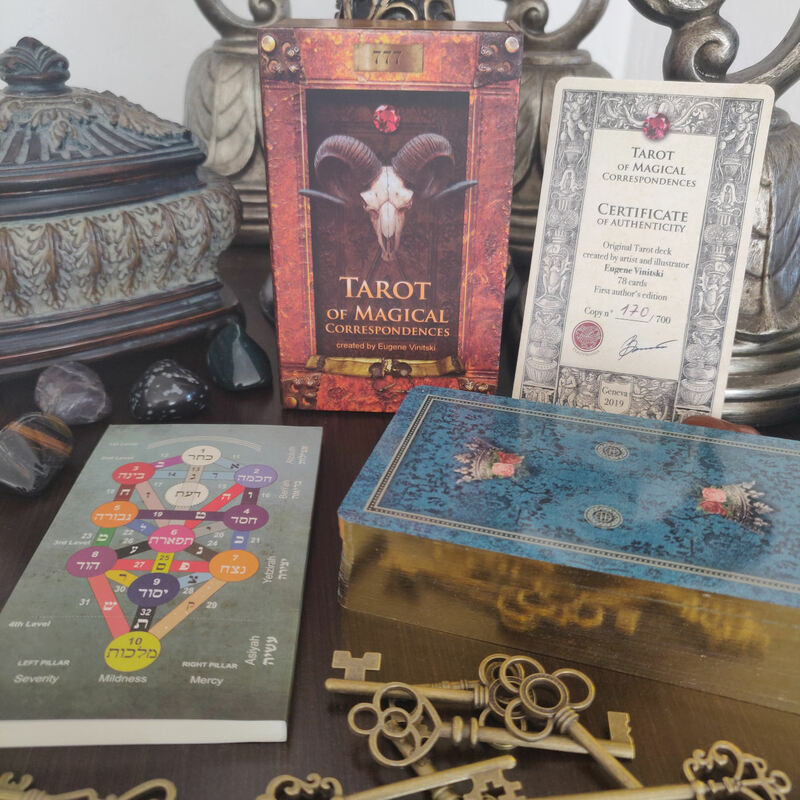 While each card is rich with symbolism to work from, there’s also sufficient space for you, the deck holder, to include your own. I love that! Vinitski encourages you to add to the collage spread you see on each key. Here, the Major Arcana represent the dynamic part of the Tree of Life and are associated with moving from one sephira to another. A handy illustration for reference appears on the back cover of the booklet that comes with the deck. Color correspondences are also significant here. In the Majors, the coloring of the keys are based on the Queen Scale of Color per Crowley’s tables. In contrast to the Majors, the Minor Arcana keys are rigidly bound to a static Sephiroth. And here, in the Minors, the coloring is based on the King Scale. Thus, the binary is expressed, where the King scales represent the Emperor and the Sephiroth, while the Queen scales represent the Empress and are colored to delineate the Paths of the Tree. In the Minors, you’ll find a living being correspondence, real or imaginary, attribution on the pentagram (in the 5 of Wands, you’ll see the bottom right point of the pentagram illuminated), the symbol of the card, element of the suit (for the 5 of Wands, you see the flame), precious stone, psychic sense of the suit (her you see the eye, for the vision of power), and corresponding plants, real or imaginary. 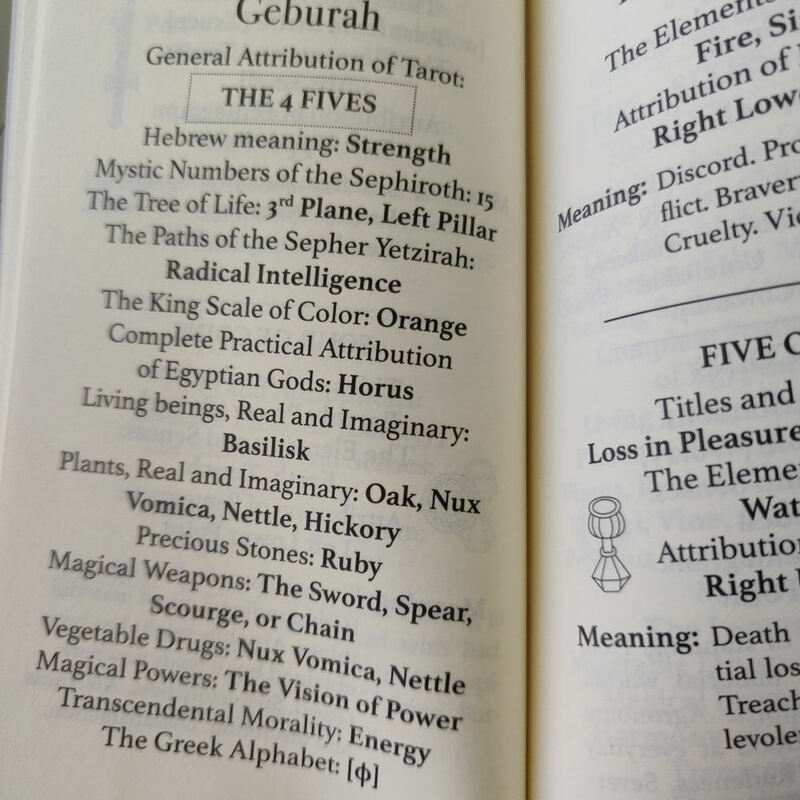 The Fives in the tarot deck correspond with Radical Intelligence in the Paths of the Sepher Yetzirah. The living being the Fives are associated with is the basilisk and the precious stone is ruby. 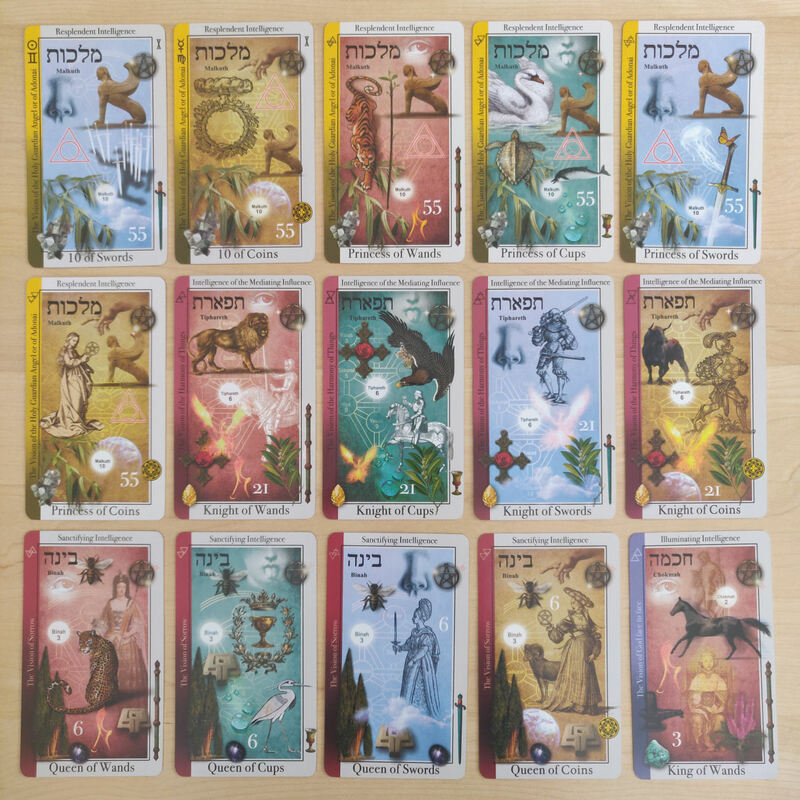 For each noted card or set of cards, begin by reading and studying the relevant sections in the deck’s guidebook, then one by one, study and familiarize yourself with the imagery on the cards, and then as an optional third step, do external reading and research to add to your Kabbalistic understanding of the cards. 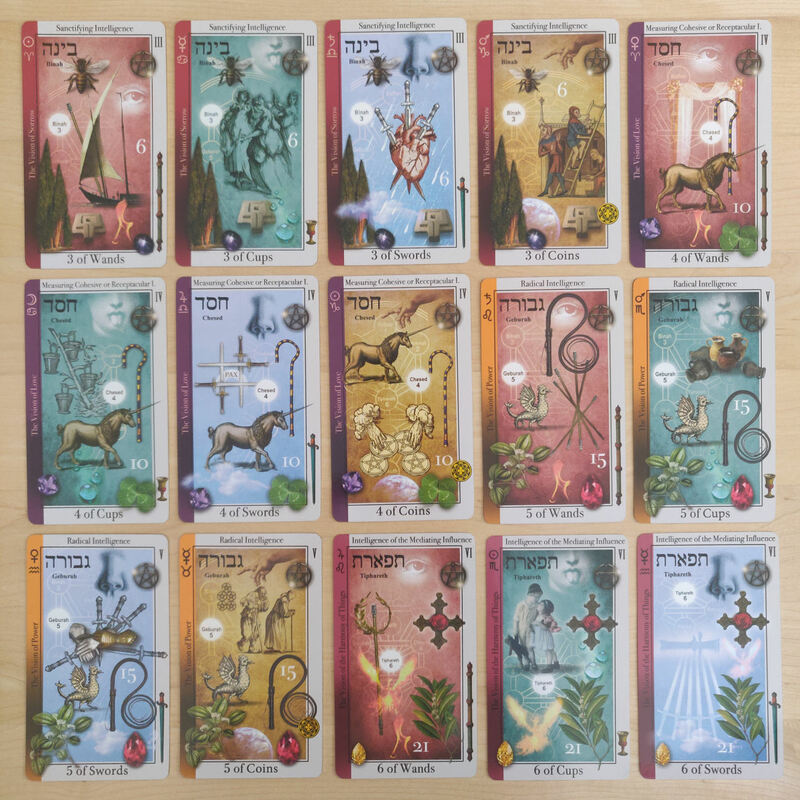 If you’re serious about using the Tarot of Magical Correspondences for study, then here’s the above syllabus table in either PDF or DOCX format. Note that the paper size is set to A4, European standard, not US Letter. 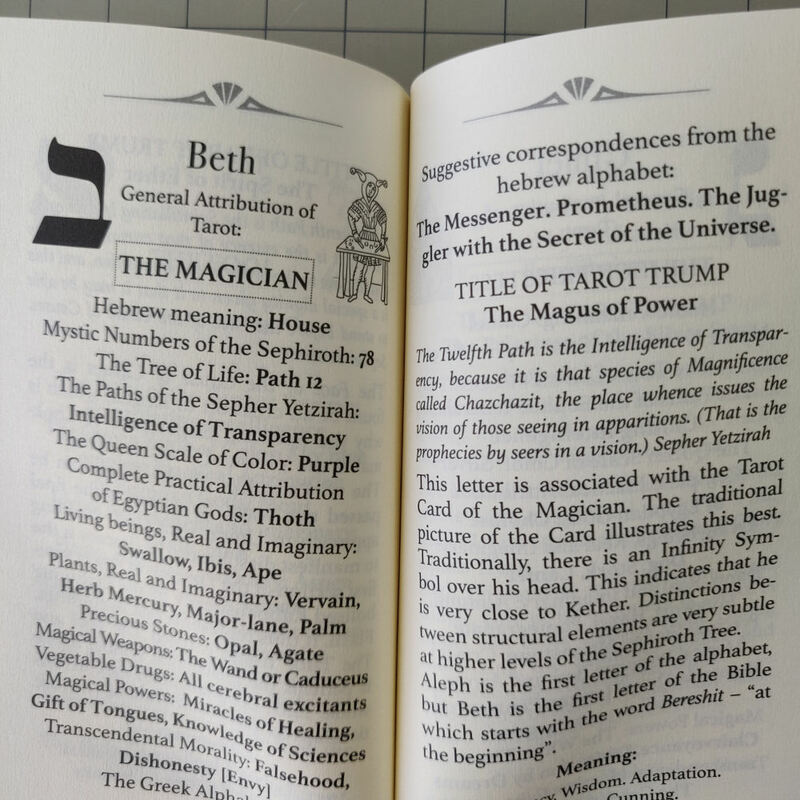 For the “Additional Reading” part, check out T. Susan Chang’s Tarot Correspondences, which will supplement your esoteric tarot study nicely. 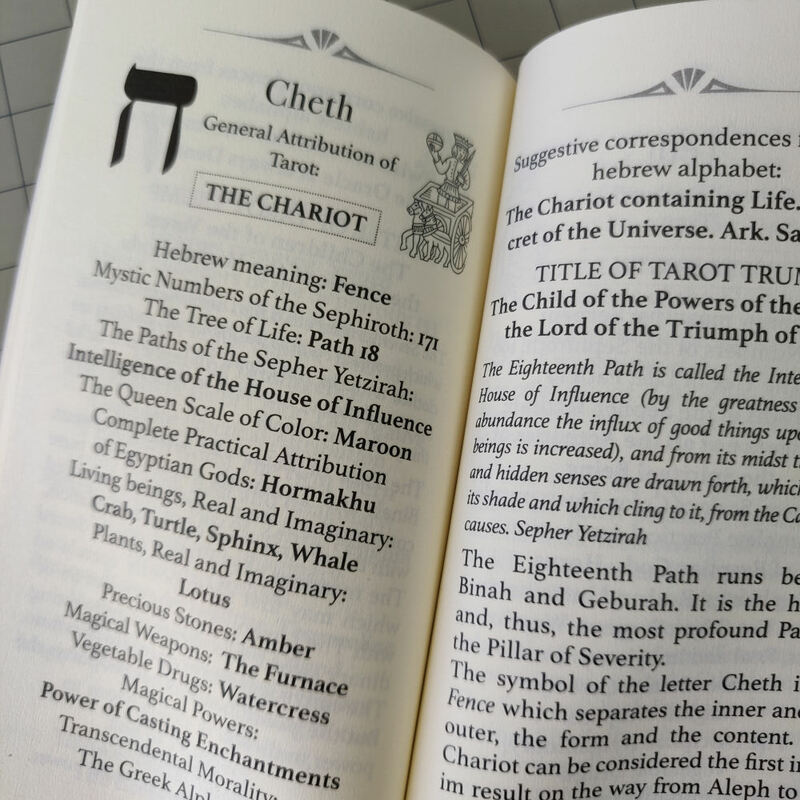 So, for instance, as you’re working through Module 1, after study of Vinitski’s guidebook and the imagery on the cards, locate the correspondences for that set of cards in Chang’s Tarot Correspondences book. I would keep a journal of notes, with clear titles and page sections to keep those study notes organized. Another example. Here in the 8 of Swords, the Eights of the deck represent Splendor and the mystic number of the Sephiroth 36. The color correspondence, noted in the left vertical margin, is violet. The Egyptian god associated with the Eights is Thoth. The sense associated with the suit of Swords is smell, hence the symbol of the nose on the card. For anyone looking to deepen their study of esoteric tarot, you can’t do better than getting a copy of Vinitski’s Tarot of Magical Correspondences. 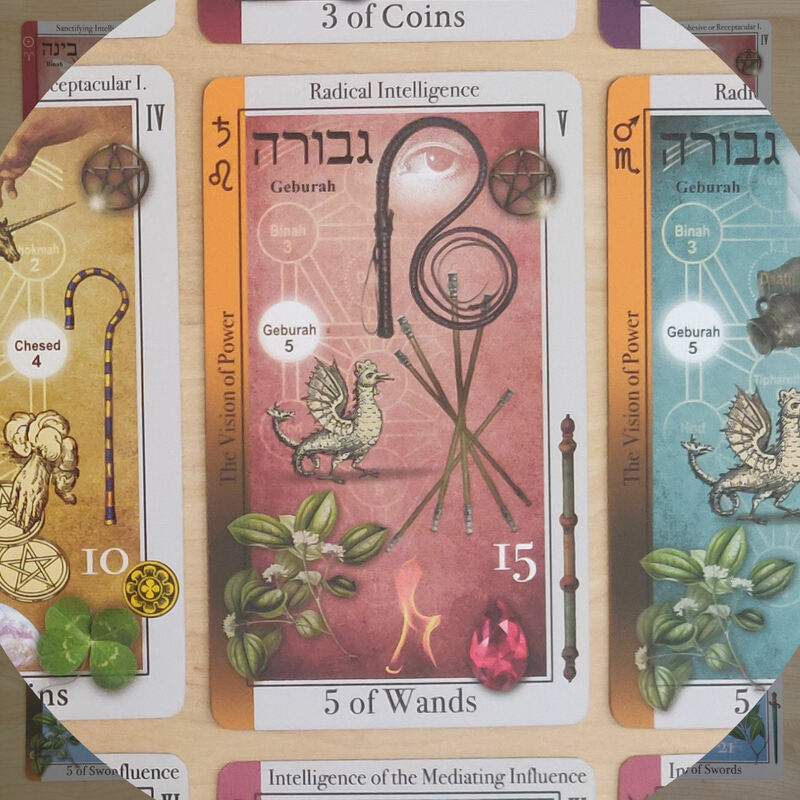 The guidebook also suggests using the cards for meditation and pathworking. 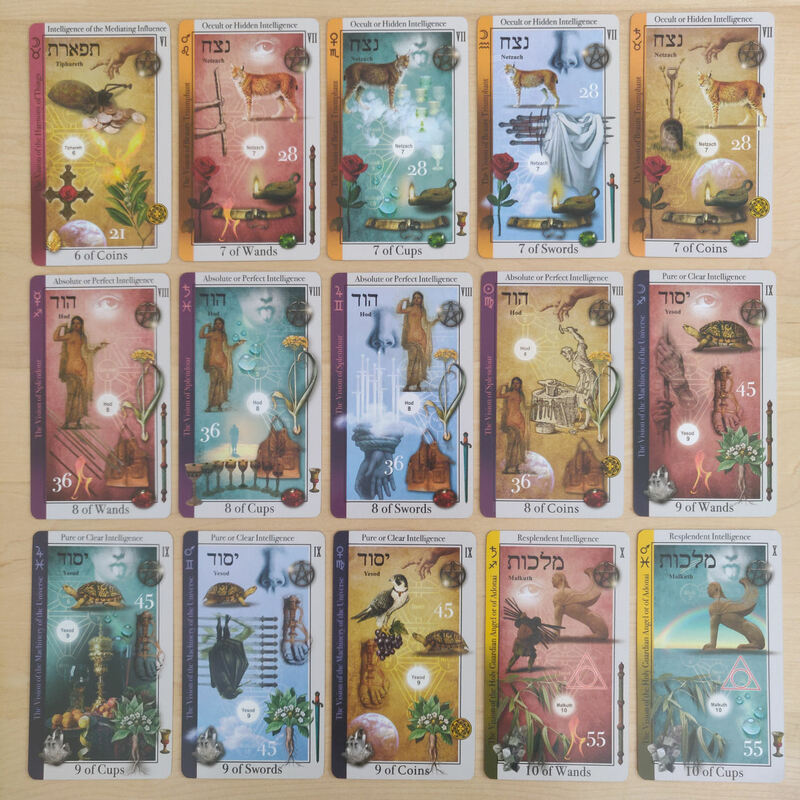 And again, don’t forget about Vinitski’s recommendation to integrate your own symbolism and correspondences on each card. You could cut symbols out and paste them onto the cards with a permanent scrapbooking glue stick or find sticker sheets and affix stickers of notable iconography. The box that the deck comes in, by the way, is luxurious. 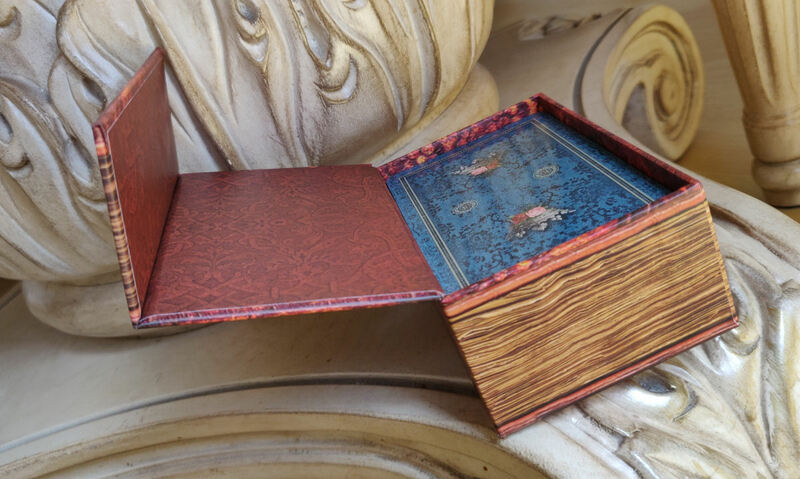 It’s a magnetic clamshell box that opens along the side. It’s classic of Vinitski’s style to leave no detail overlooked. The gold edging with the blue card back design in contrast is just exquisite. 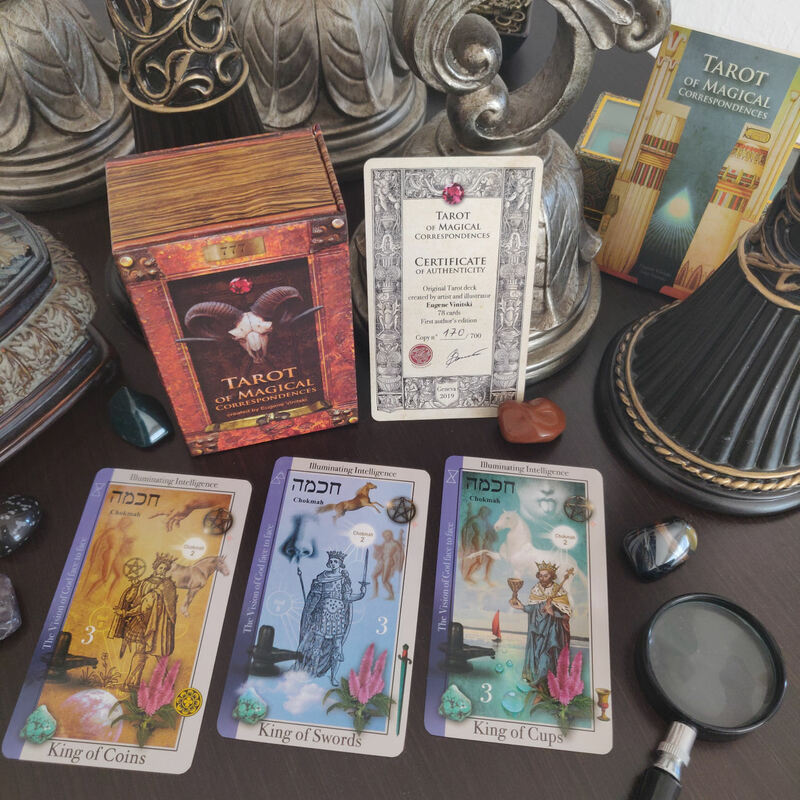 As a divinatory reading deck, this one is above my pay grade and I had some trouble doing straight tarot readings with it, but as a study deck, I was impressed with how much this deck and its guidebook unlocks for me. 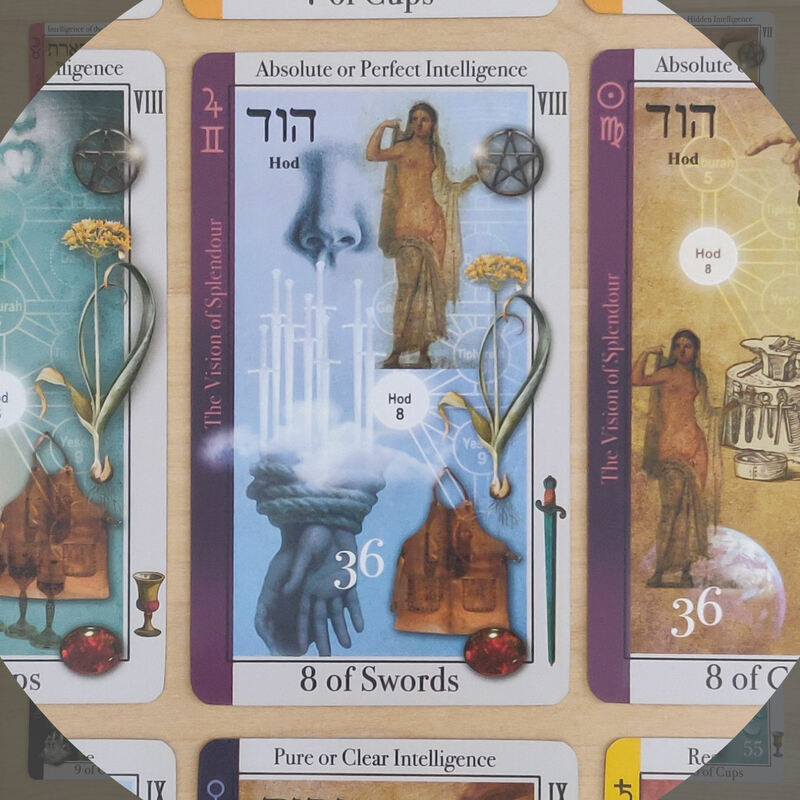 If you’ve been working with Crowley’s Liber 777, this deck is going to help supplement your study of Liber 777. 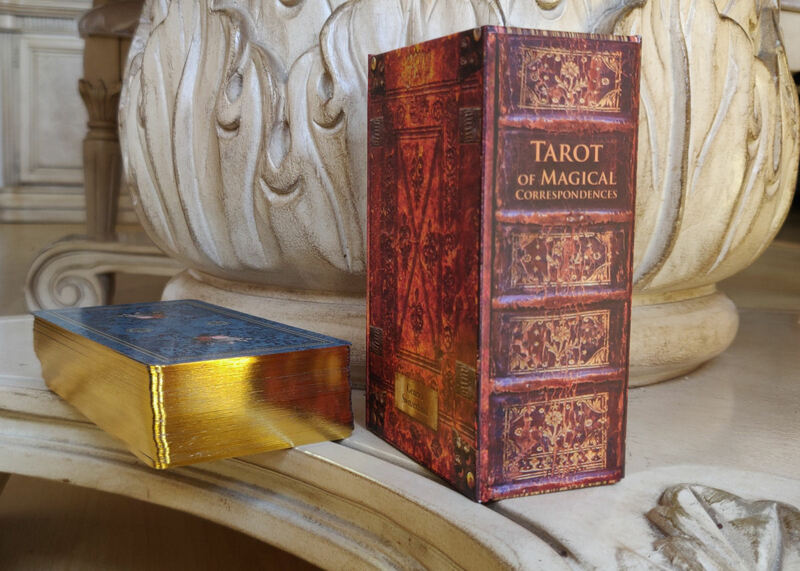 Eugene Vinitski’s Tarot of Magical Correspondences is a wealth of research consolidated into a powerful magician’s deck, one that will deepen your understanding of the tarot and of the universe to depths that you didn’t even realize you were capable of achieving. What an important and significant contribution to the world of tarot, Vinitski! 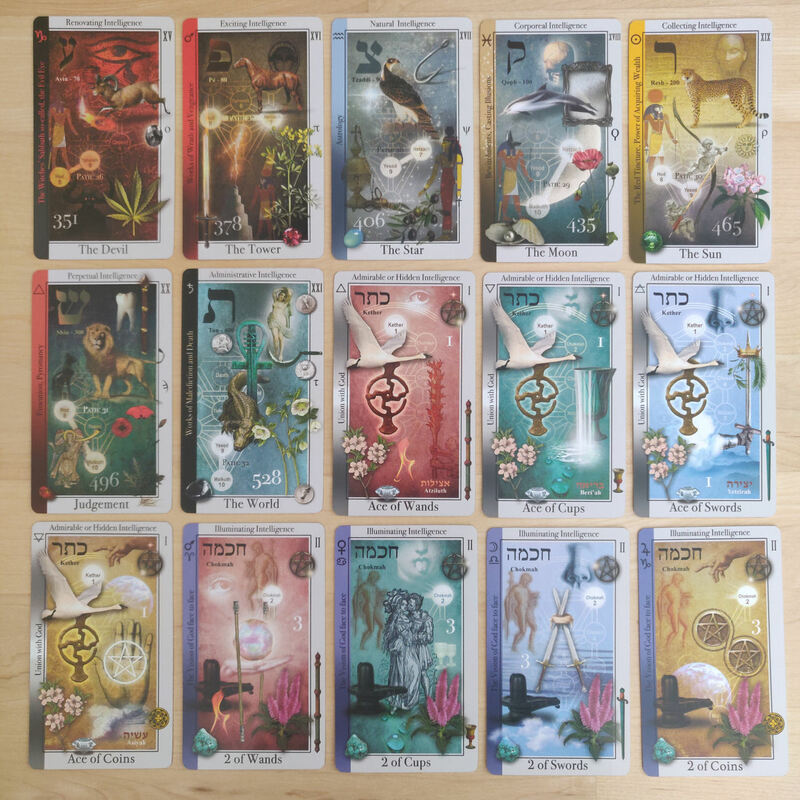 You can order your copy of Tarot of Magical Correspondences here on Vinitski’s Etsy shop. 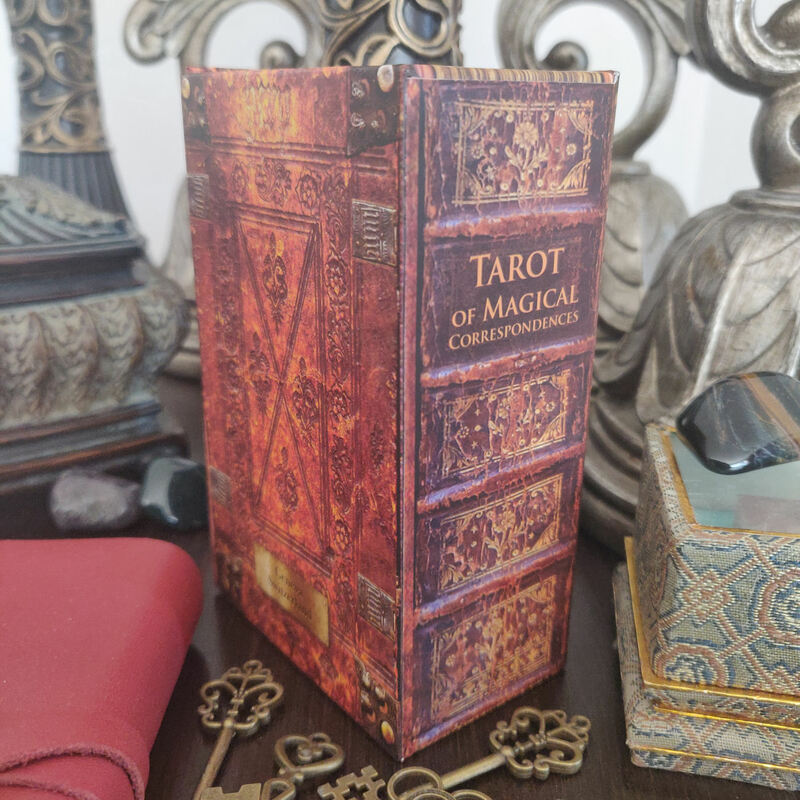 FTC Disclosure: In accordance with Title 16 of the U.S. Code of Federal Regulations Part 255, “Guides Concerning Use of Endorsements and Testimonials in Advertising,” I received the Tarot of Magical Correspondences from the deck creator for prospective review. Everything I’ve said here is sincere and accurately reflects my opinion of the deck. Hooray! I’m so glad you did this review, I’ve been waiting for my copy to get here. Thank you for the study guide. I’m excited, yet a little nervous, to get this deck because it’s so detailed and packed with information. 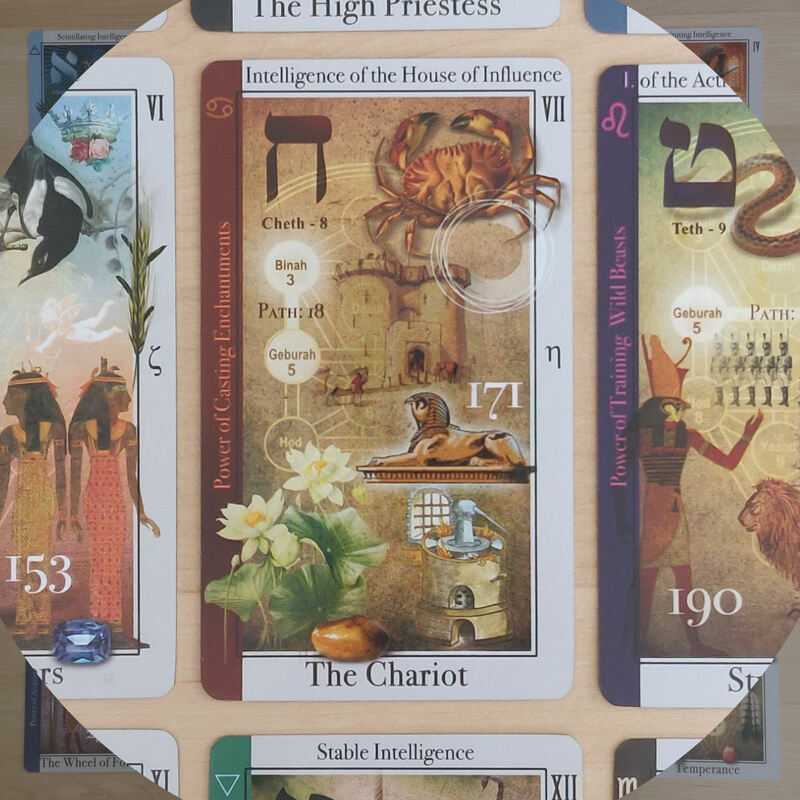 This deck is stunning and chock full of detailed information. Specific symbology on certain tarot decks greatly enhance my reading interpretation. Hands down, this will be added to my wish list! Thank you for sharing your feedback, Benebell! I’m very much enjoying working with this deck! Thank you for your in-depth reviews! Thank you for your review of this deck. I really appreciate your creation of a study guide. I can’t wait until my deck arrives.